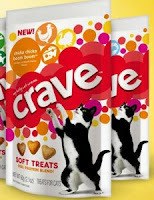 Bogo FREE Crave Cat Treats Coupon! Only $0.74 at Walmart! Hurry and print this Bogo FREE Crave Cat Treats coupon! These cost $1.47 at Walmart, so only $0.74 each after coupon.